What’s your favourite Valentine’s gift? Roses, champagne and chocolates? They’re all familiar favourites. But this year, it’s time to think of something new. Step forward the Gourmet Brownie. Brownies aren’t just the ultimate comfort food, they’re the ultimate happy food. We love seeing our brownies make you smile. Spreading the joy is a big part of what we do – whether it’s packing up a gift ordered online or greeting customers at an event. And what better time to spread some happiness than Valentine’s Day? Take the worry out of finding the perfect gift and let our brownies do the hard work for you. Our new gift boxes are the perfect way to say, “I love you”. Each sturdy tin contains a gloriously indulgent selection of our favourite brownies. The Sweetheart Brownie Tin pairs our Signature chocolate brownies with our Raspberry Infusion brownies – or choose a delicious slab of our gloriously gooey Snickers brownie for a real treat. Forget about wine, flowers and perfume – our brownies are the present that’ll appeal to just about everyone. The only thing nicer than receiving a box of brownies is sharing them with someone you love. Have a sumptuous breakfast in bed or enjoy them after a romantic dinner for two. Our brownies aren’t mass-produced. They’re made with love and care in our small bakery – and it shows. Each mouthful is rich, satisfying and memorable. Even if you can’t be with the one you love this Valentine’s Day, you can still make them smile with a box of our hand-baked brownies. We can include a personal message with all orders, so don’t forget to tell them why they deserve a brownie moment. Heading off to a romantic bolthole, or a walk-in the country? Our brownies are the perfect treat to share during your getaway – whether it’s at the top of a mountain or snuggled by the fire. Our new gift tins are perfectly portable and can be re-used again and again. 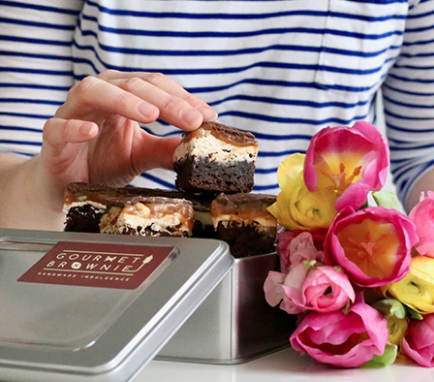 So, go on – give the gift of happiness this Valentine’s Day with a box of Gourmet Brownies. It couldn’t be easier to spread some joy. Rather see us in person? We’ll be at Love Food at Burwash Larder in Cambridgeshire from the 10-11 February 2018– the weekend before Valentine’s Day. Come and say hello! Click here to view our full range of gift boxes by post.